However, if the global financial cycle does not explain most, or even much, of the variation in capital flows, then the policy authorities in small and emerging countries have more freedom to manage their economies. Looking at it another way, the same policymakers would not be able to blame the global financial cycle and therefore centre-country fundamentals for their internal problems. So it is important to figure out whether the global financial cycle is a juggernaut – an irresistible and overwhelming force – or an anticlimax that plays a relatively small role in driving capital flows, but one that perhaps can be used to divert attention from domestic mistakes. In my recent research with Eugenio Cerutti and Stijn Claessens, we quantify the importance of the global financial cycle for capital flows (Cerutti et al 2017). We use a conventional approach, with widely used data, techniques, capital flow models, and statistical metrics. The drivers of the global financial cycle that we examine included measures frequently used by other researchers: risk (the VIX index for example, a measure of volatility expected in the stock market), monetary policy (nominal and real interest rates, the TED spread and the slope of the yield curve), and other fundamentals (like growth of GDP, the exchange rate, and the money supply). Conventionally, we assume the US is the primary centre-country source of the global financial cycle, but also consider analogues from the Eurozone and the UK. We then ask how much variation in capital flows for small and emerging markets could be explained by these global financial cycle fundamentals. We do this by regressing capital flows of a particular type, for a particular country, over time (for example, flows of debt expressed as a percentage of GDP, into Brazil, between 1990 and 2015) on our eight fundamental US variables, and then asking how well these global financial cycle drivers explain capital flows – that is, how well does the equation fit? This vanilla strategy allows us to cut through the noise about the global financial cycle and focus on the fraction of variation in capital flows that was actually explained by global influences, without being distracted by minor issues associated with data or methodology. The global financial cycle, expressed by US fundamentals, is not a good explanation for the variation in capital flows. 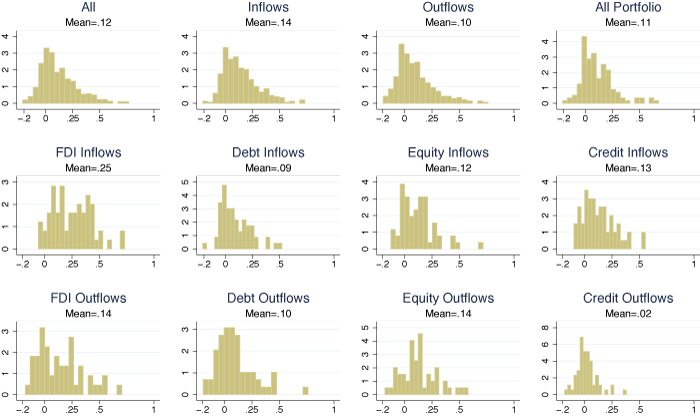 Figure 1 shows a series of time-series plots of capital flows, and the flows that are predicted by our eight US fundamentals. The top-left graph shows that actual capital inflows of bank credit for Brazil (in a thin solid line) are poorly correlated with those predicted by global financial cycle fundamentals (in a thick dashed line). Only 12% of the actual variation is explained by the fitted global financial cycle fundamentals. Inflows of Brazilian debt and equity are shown in graphs in the middle and right of the figure. Analogues for South Korea, Mexico, the Philippines, South Africa, and Turkey are in successive rows of Figure 1. Notes: Actual (thin−solid) and fitted (thick−dashed) inflows, % GDP; Eight US fundamentals: VIX, TED/yield spreads, nominal/real policy interest rates, growth in GDP/M2/REER. None of the equations fits well. The highest R2 is .34, meaning that only 34% of the variation in South Korea and South African inflows of debt is explained by US fundamentals. These fundamentals explain even less for other countries and types of capital flows. The importance for capital flows of centre-country fundamentals – the global financial cycle – is limited. The six countries and three types of capital (in)flows in Figure 1 were not randomly selected, but the weak results in Figure 1 are actually representative. 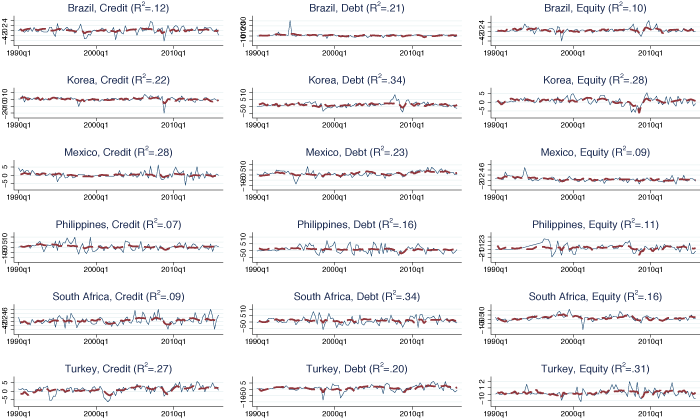 In our research, we estimate similar models (with additional measures of the global financial cycle) for 63 small countries, disaggregating capital flows (capital can flow in and out) and four types (FDI, debt, equity, and bank credit). This means that we estimate literally hundreds of capital flow equations in an attempt to understand whether capital flows were driven by US fundamentals. The vast majority of these equations fit poorly. Figure 2 shows histograms of adjusted R2 measures for our fitted capital flow equations (adjusting R2 provides a small penalty for additional regressors). The top-left histogram of Figure 2 shows the distribution of goodness-of-fit for all of the (598) capital flow equations; the average adjusted R2 is only .12, and only a few even approach .5! The poor fit of the capital flow equations seems to characterise inflows and outflows, and flows of FDI, portfolio capital (whether debt or equity), and bank credit. Figure 2 implies that it is difficult to model capital flows for small countries using only US fundamentals, at least over the past 25 years. In the study, we are careful to show that the negative results of Figures 1 and 2 are general, and insensitive to the exact way we model the global financial cycle, cut the data, and so on. We show that our results were robust to adding lags, using European and British fundamentals, dropping outliers, using different measures of goodness of fit, and splitting the sample by income, time, region, degree of capital mobility, and exchange rate regime. It is difficult to explain much variation in the capital flows of small and developing countries using only centre-country (US) fundamentals. As a conservative estimate, perhaps a quarter of the variation in capital flows arises from the global financial cycle. The rest presumably arises from domestic causes. Despite the impression given by recent studies, most variation in capital flows for small and emerging markets has not been not driven by the global financial cycle. No more than 25% of the fluctuations in capital flows can be ascribed to fluctuations in global risk aversion or the stance of US monetary policy. This should be welcome news to policymakers in small countries. On the other hand, it also means they cannot reasonably blame foreign influences for their domestic problems. Autonomy comes with responsibility. Bruno, V and H S Shin (2015), “Cross-Border Banking and Global Liquidity”, Review of Economic Studies 82, 535-564. Cerutti, E, S Claessens and A K Rose (2017), “How Important is the Global Financial Cycle? Evidence from Capital Flows ”, CEPR discussion paper 12075. Forbes, K J and F E Warnock (2012), “Capital Flow Waves: Surges, Stops, Flight, and Retrenchment”, Journal of International Economics 88: 235-251. Rey, H (2013), “Dilemma not Trilemma: The Global Financial Cycle and Monetary Policy Independence”, in Proceedings of the 2013 Federal Reserve Bank of Kansas City Economic Symposium at Jackson Hole: 285-333. Rey, H (2015), “International Channels of Transmission of Monetary Policy and the Mundellian Trilemma”, Mundell Fleming lecture, IMF Economic Review 64(1): 6–35.